the WRITE Balance: What Kind of Acorn Am I? The inspiration for the Race Car's middle name is from Ralph Waldo Emerson because I love so many of his quotations. 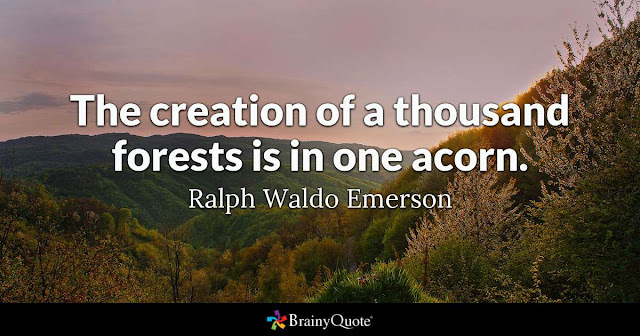 A thousand forests coming from one acorn is a perfect reminder of how our life and its influence on those around us can be exponential. I've heard it said that we are always one generation away from <enter your glory or doom of choice> and that puts a huge responsibility on me. I vividly remember when we got our first computer and later our first cell phone. I remember things like irc and aol and you've got mail. But I also remember waiting for the mailman with agony and excitement to see if my friends wrote me back. That's right, letters! My world changed so drastically around 1994 - much more than I realized at the time - and has only sped up since. So here I sit at 38 with children of my own and a whirlwind of responsibilities, desires and questions that often bring me back to a time that didn't feel rushed, exhausted or as complicated. It's not some biased memory that has forgotten all the troubles of the time, because life has always been complicated. But we have let our technology and mass media set the pace of life and rarely ask if that's okay with us. We accept 3 practices a week plus games and tournaments as okay and normal. We accept eating dinner at the drive-thru as normal. We don't bat an eye when doctors and schools make demands of us or our children that aren't best for them. We might complain that Hollywood has its standards messed up and yet we are continually adapting to them as though they are considering what is healthy and good for you. My little family of 5 is just one in so many more, but Mr. Emerson's implication is packed with wisdom. The kind of people my three children become might influence their own little family of 5 and then those little families create more families and then the exponential influence is off and running. The trouble is if we're just trying to get all the wants satisfied rather than focusing on the needs, the forest this little acorn has created is full of disease and destruction or there's no forest at all because none of it survived. No matter what is trying to demand something of us, if the emotional and spiritual well-being of our families cannot be honored as well, then we must choose an alternative. Slow down. When you catch yourself saying "I can't because..." (because I know you will), back up and start to look for ways you can. It might lead to saying no to things, but it also just might help you pay attention better. Think great-grandkids. Every generation is going to have a harder time slowing down. Will your great-grandkids have a legacy of true living or mindlessly chasing ambition? Will they have courage to choose simple things because their grandparents did too or will they take a bad cue from you thinking the only way to make it in life is to compete, adapt and get their first? Go outside. I know I say this a lot, but the natural world is the best argument for what God desires of us. We reap what we sow. A tree bears fruit after its own kind. What we choose to put into our families is the future ahead of us. Let's course correct and ground ourselves and our families in genuine relationship, rest, and a growing community according to God's design.